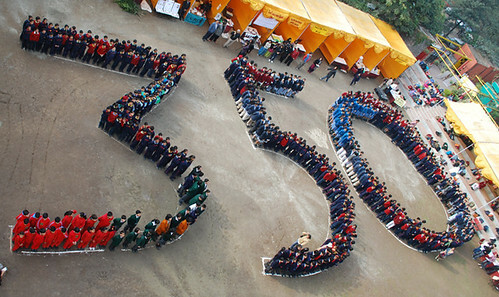 350.org. A global movement to solve the climate crisis. 350.org is an international climate grassroots campaign with a mission to solve the climate crisis through online campaigns and mass public actions. You might have noticed Moving Planet on September 24th, a day organized by 350.org with over 2000 events in 175 countries, demonstrating through motion – marching, biking, skating – and calling for the world to move beyond fossil fuels. 350.org’s website is full of colorful and inspirational videos like this one of people all over the world joining together to bring awareness to the climate crisis. Check out more videos here. So, why 350? 350 refers to 350 parts per million (ppm) of CO2 in the atmosphere – which is considered by scientists to be the safe upper limit in order to preserve the planet and avoid warming which is already leading to disastrous impacts such as glaciers melting (re. source of drinking water for 100s of millions of people), mosquitos spreading to warmer places (re. bringing along malaria and dengue fever), drought, and sea levels rising. For all of human history, we were at 275 ppm until the industrial revolution hit 200 years ago, and since then, this figure has been consistently rising to where we are today at about 389 ppm. We’re all somewhat aware of these facts — but there’s something incredibly powerful about seeing these three simple characters – 3 5 0 – exhibited all over the world to remind us about the severity of the climate issue. Stop the Tar Sands, which they recently declared a victory as the Obama administration decided to delay the Keystone XL tar sands pipeline project until 2013, effectively killing the project. Don’t Frack the Delaware, a movement to reject the proposal to open the Delaware basin to fracking through petitioning, calling governors, rallying on November 21st at the DRBC hearing, and spreading through word through social media. I hate to unveil the unspoken, but on top of being poignant and 350.org just seems so .. fun and hip. Don’t you just want to be friends with them? ← Novomer. Catalyzing green chemistry.